So I first got wrapped up into the fanfare surrounding the show by hearing about the book and that it was going to be adapted by Netflix for the small screen ( I'm a sucker for book adaptations). When the show first dropped, I couldn't believe how caught up I got in and its message. Being in my thirties I'm far removed from the drama of the enclosed walls of the hyper emotional and at times, hyper toxic environment of High School. But what I felt '13 Reasons Why' did an exceptional job at was creating a dialog about what life "can" be like inside those walls and what adults, other teens and young adults can do to make it better. And while the shows' content is quite graphic and upsetting, it's not gratuitous. In closing, I think the show is eye opening, adds value to the cultural conversation and when looked back on will be reflective of a very real and very tragic dark period of our history of instances of sexual assault and senseless gun violence. And while the show may not have the answers to how we can fix the problem I believe it's creating a dialogue about how we can attempt to move forward and be better. The thing I appreciate most about the show is that it does its homework. 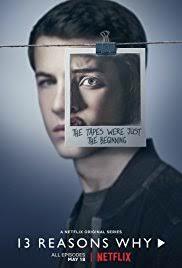 You can watch '13 Reasons Why/ Beyond The Reasons' from seasons 1&2 on Netflix, which covers how the show consulted psychologists, activists and with a mother who tragically lost her son to suicide, allowing the show to stay grounded in reality despite its fictional world.